Apply a dab of the product on washed, towel-dried hair. Proceed with blow-drying or styling as usual. My friends say that i am so high-maintenance...i use a lot of skincare products, and no matter how sleepy, tired or drunk i am, i won't forget to slap on these products. And if there's one thing that i dont really fuzz about...it's my hair. yep, i don't go thru such things as hot oil, protein treatments, etc. i can use any shampoo and conditioner and most of the time, i just air-dry my hair. I color my hair every 5-6 months though, and i use hair color serums just to maintain the color and shine. After almost 4 years of sporting a short 'do, i now have a long hair (way past my shoulders) and i am loving it. but the hassle of air-drying my hair everyday doesn't help me to avoid being late from work. LOL. I actually thought of cutting it again, until i met this product. I am so thankful of Shen for giving me this a month ago. I was hesitant at first, for i am not used to applying other stuff on my hair aside from my L'oreal Elseve hair serum (the red one). But oh boy, i am so glad i did try it. smells good. how i hate the smell of some hair products...there are some that smells like rubber, eww! 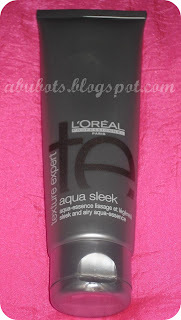 i think this Texture Expert from the L'oreal Professionnel line isn't available at regular stores. correct me if i'm wrong, but i think you can grab them from your hair salons that offer L'oreal hair products. i am so loving this product. i haven't finished my first tube but i already am planning on stocking up as i don't want to ran out of my current HG hair product...well, who does!? omg, your HG?! i wanna get this now..